The answer was “no.” C. S. Lewis could not write “directly theological pieces” for Christianity Today. His days of writing straightforward apologetics were over, as he explained in response to a request from editor Carl F. H. Henry in 1955. I wish your project heartily well, but can’t write you articles. My thought and talent (such as they are) now flow in different, though I trust not less Christian, channels, and I do not think I am at all likely to write more directly theological pieces . . . If I am now good for any thing it is for catching the reader unawares – thro’ fiction and symbol. I have done what I could in the way of frontal attacks, but I now feel quite sure those days are over. Lewis’s reason was strategic—the times had changed and, for his part, a new approach was required. He would no longer pursue the “frontal attack” of his previous books and essays. Lewis’s explanation of “stealing past watchful dragons” by using fairy tales appeared in a 1956 article entitled “Sometimes Fairy Stories May Say Best What’s To Be Said,” the same year that the inaugural issue of Christianity Today was published. In a recent article in Christianity Today, Dan DeWitt reminds us that Lewis’s last straightforward defense of the gospel was his book Miracles, which appeared in 1947. He then turned to writing fiction, completing The Lion, the Witch and the Wardrobe in March 1949. It was published in 1950 and the entire series, The Chronicles of Narnia, was in print by March 1956. 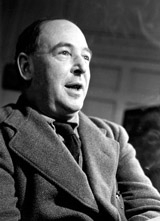 For more information on the strategic change in C. S. Lewis’s writing career, see Dan DeWitt’s recent article, “Why C.S. Lewis Didn’t Write for Christianity Today.” For even more information on Lewis’s career as an apologist, see DeWitt’s very helpful short essay “The Apologetics of a Talking Faun: A Sketch of C. S. Lewis”—a short booklet in pdf. Can the West survive without religion?